Een prachtig ingerichte cottage met 2 slaapkamers en een aparte studio met een slaapkamer (en een tweede badkamer), gelegen in een rustige straat van Halls Gap en dicht bij wandelpaden. Dit goed uitgeruste vakantiehuis heeft een kingsize bed en een queensize bed in het hoofdgebouw en een queensize bed met eigen badkamer in de studio. 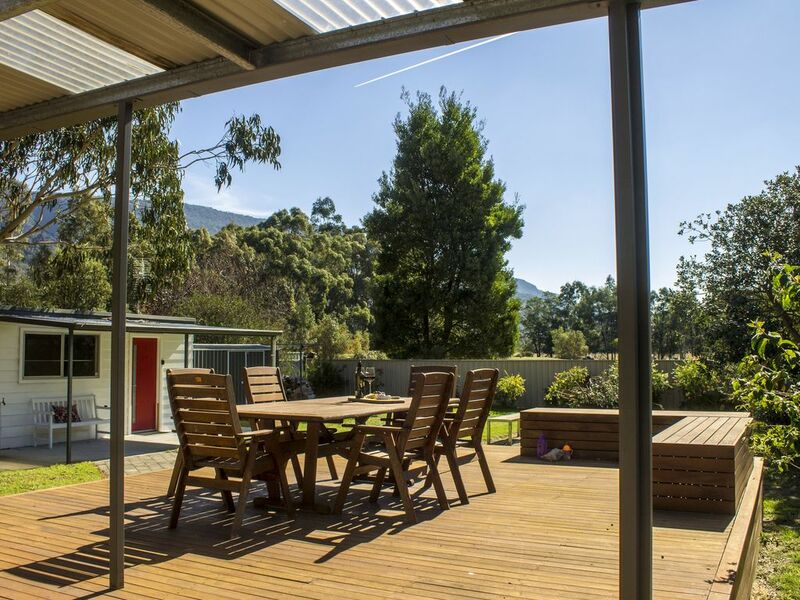 Een grote achtertuin met een nieuw terras, tuinmeubilair, gas bbq en een vuurplaats voor de wintermaanden om te zitten en te genieten van de omgeving van het Grampians National Park. The house was large, clean and located close to hiking trails, town and the cultural center. Decorated in a retro style, it was comfortable and the listed amenities were appreciated. We had an issue with the heater, but once we contracted the owner, she solved the problem immediately. We would stay here again if we returned to the Grampions. although the decor was unusual, we thoroughly enjoyed our stay at the Gap. Kangaroos, birds, silence and incredible star field. wonderful location close to everything. 3 couples stayed comfortably. Great outside area. DVD's present for rainy days. Amaizing Experience!Excellent Home away from home!! My family and I loved the well kept home, the standards of cleanliness very high. The interior decor was very beautifull, the house nice and warm, and most of all the beds were very comfortable..Every element of the house was as listed...The property is also very close to most of the tourist attractions almost walking distance... waking up to wildlife in the backyard was the best attraction during our holiday. Janet is a lovely host and very understanding..We are so going back there, and I recommend the house as a nice place to stay when you are out that way. Thoroughly enjoyed my stay - especially watching the kangaroos and deer over the back fence in the morning. The house was very well appointed with an excellent selection of utensils in the kitchen. A very comfortable bed for a good night sleep, a well supplied laundry, a great deck outside for sitting and a good walking distance to the ice creamery. Clean and comfortable made for a relaxing weekend away. Thankyou for providing a great place for a refreshing break. House is very well appointed and kid proof - has 2 large bedrooms in the house with comfy double beds. Our teenage daughter loved her 'retreat' (room with small ensuite) in the backyard. Living room spacious, well appointed kitchen, deck really large overlooking a park with much wildlife (roos, rosellas, cockatoos). If you are looking for luxury, this is the wrong house. But would definitely book this again as very convenient to walk into Halls Gap, very quiet, well set up. Main feature for us was the backyard and location!